The Boulevard City Suite is located at 3 N. Boulevard is a 1 bedroom / 1 bathroom spacious unit with a cozy living room on the first floor. The bedroom, bathroom and full eat in kitchen are located on the second floor. The apartment features a queen sized bedroom and full size futon in the living room. Newly renovated kitchen and bath, gives our guests all the comforts of home during their travels. 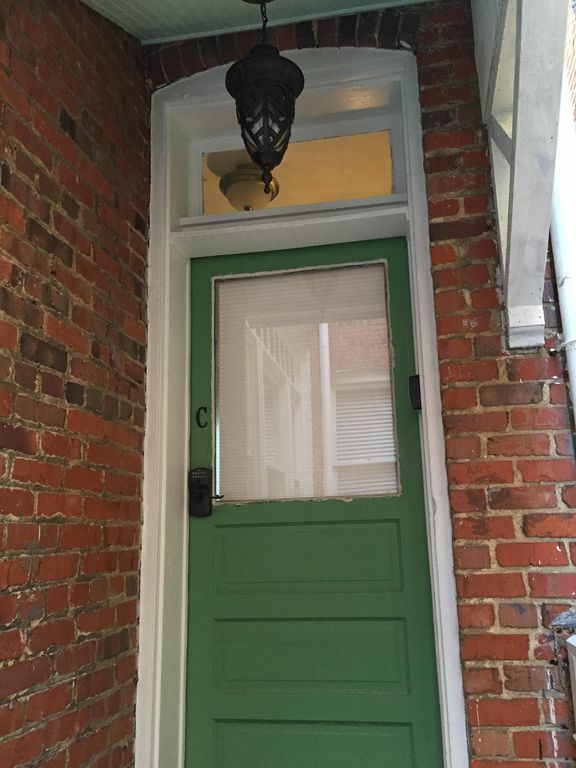 Huge original windows and gorgeous crown molding add to the historic charm of this unit. The unit also features a private sun porch off of the bedroom...a great spot to enjoy your morning coffee or a glass of wine on a nice day. With Carytown a block away and the surrounding museums and activities, you will feel like a part of the community when you stay with us! We have lived on Richmond's Historic Boulevard over 14 years at 1 N. Boulevard which is right next door to the rental property at 3 N. Boulevard. This property has been completely renovated offering a fabulous, safe and cozy lodging option to Richmond visitors. You'll feel right at home in our apartment overlooking the Boulevard and have the luxury of many dining and tourist attractions all within steps of your front door! We purchased this home for several reason. First, the property was desperately in need of some TLC and we felt we were the right people to do give it just that. Second, we have a passion for providing travelers to Richmond with cozy, inviting accommodations that make them feel at home. This house has such fabulous historic character and charm. We love the Boulevard and all of the historic homes on it. The property at 3 N. now shines with warmth and charm and offers a comfortable, safe and friendly environment for visitors to our charming city. The living room has a full size futon that would sleep one adult or child. Please request additional linens if using the futon. Small but well appointed apartment in the museum district close to Carey town was just what we hoped for. Our stay in this Richmond town home was perfect. We even got an upgrade to the the larger apartment because the owners were making an effort to accommodate the previous guests who wanted to stay a bit longer. Everything was clean and made up and beautifully decorated. The kitchen is well-stocked with everything you need. The beds are comfortable. The apartment is walking distance to tons of delicious restaurants. I highly recommend. Thank you so much for taking the time to share your feedback! We are thrilled that you enjoyed the apartment and hope you will come see us again! Everything was so comfortable and thought out, everything I needed was there. Coffee, creamer, throws on the couch, shampoo and more and so clean! There is a very nice deck to sit and drink your coffee with comfortable chairs, and the location is easy walking distance to the Museum. Polly was a dream to work with. There are steep stairs just in case that is an issue for anyone. The living room with TV is on the ground floor while the bedroom, bath and kitchen are on the 2nd floor. Thank you so much for taking the time to share your feedback! We are so happy that you liked the apartment and hope you'll come stay with us again soon! Very nice 1bedroom apartment with plenty of room. Very charming and nicely decorated. Would definitely go there again. Thank you so much for taking the time to provide your feedback on our property! We are thrilled you enjoyed the accommodations and look forward to hosting you again on your next visit to Richmond! We had a wonderful time staying here while exploring Richmond. The apartment is very comfortable, in a wonderful location and decorated with great care. We would definitely stay here again! Absolutely fantastic apartment, perfectly appointed with everything one needs for a stay away from home. Private, cozy, comfortable, stylish - you won't want to leave. Ideally located within walking distance of numerous restaurants and shops. Private off street parking just feet from the door - a luxury in the Fan and perfect for late arrivals. The owners are exceptionally accommodating and responsive and take impeccable care of this and their neighboring B&B. Won't stay with anyone else in RVA again! This property is a non-smoking / no pet property. Violation of this rule will result in a $250 penalty.